Posted on 1, April 2016 by EuropaWire PR Editors | This entry was posted in Art & Culture, Awards, Netherlands and tagged Dr A.H. Heineken Prize for Art 2016, Dutch visual artist, Yvonne Dröge Wendel. Bookmark the permalink. AMSTERDAM, 01-Apr-2016 — /EuropaWire/ — The international jury for the Dr A.H. Heineken Prize for Art has unanimously selected Dutch visual artist Yvonne Dröge Wendel as this year’s laureate. Dröge Wendel will receive a cash prize of EUR 100,000, half of which is meant to finance a publication and/or exhibition. The jury has praised Dröge Wendel’s work for its originality, inventiveness and vitality. The Dr A.H. Heineken Prize for Art is the Netherlands’ most prestigious prize for visual artists. It is financed from a private fund, the Dr A.H. Heineken Foundation for Art. The prize is being awarded for the fifteenth time this year. The award ceremony will take place on Thursday 29 September 2016 in Amsterdam. The jury for the Dr A.H. Heineken Prize for Art has praised Yvonne Dröge Wendel’s work for its originality, inventiveness and vitality. The drive behind her work is tangible and visible in her playful, philosophical studies of how objects influence human behaviour. 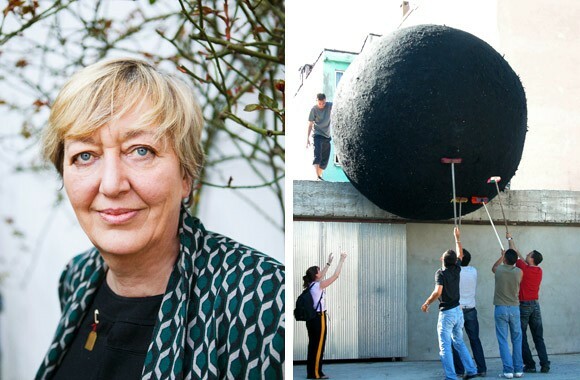 One notable example is the artwork Black Ball, a large felted ball measuring 3.5 metres in diameter, that the public moves down streets and alleyways and through gates and doorways. People respond with visible enjoyment to the ball and interact spontaneously with it. In her PhD research project, she is examining the relational and performative abilities of things, a theme that touches on present-day questions about our relationship to the world around us. By awarding the Dr A.H. Heineken Prize for Art to Yvonne Dröge Wendel, the jury is emphasising the potential of art to change our perception and experience of the world. The jury for the Dr A.H. Heineken Prize for Art is chaired by Kitty Zijlmans, Professor of Art and Architectural History at Leiden University. Its members are Catherine David, Deputy Director of Centre Pompidou; Wendelien van Oldenborgh, visual artist and Dr A.H. Heineken Prize for Art laureate in 2014; Carla Sieburgh, Professor of Law at Radboud University Nijmegen; and Steven ten Thije, art critic and L’Internationale project leader. Alfred Heineken established the prize that bears his name to recognise and encourage exceptionally talented artists. The Foundation awarded the prize for the first time in 1988 and since then every other year to an outstanding artist living and working in the Netherlands. The prize consists of a sculpture, a publication and/or exhibition (budgeted at EUR 50,000) and a cash prize of EUR 50,000. Previous laureates include Peter Struycken, Mark Manders, Barbara Visser, Job Koelewijn, Daan van Golden, Aernout Mik, Guido Geelen and Wendelien van Oldenborgh. It has now been more than fifty years since the Dr H.P. Heineken Prize for Biochemistry and Biophysics was awarded for the first time. Since then, five more Heineken Prizes have joined this internationally prestigious prize for science: the Dr A.H. Heineken Prize for Art (1988), Medicine (1989), Environmental Sciences (1990) and History (1990), as well as the C.L. de Carvalho-Heineken Prize for Cognitive Science (established in 2006 as the Dr A.H. Heineken Prize for Cognitive Science). Alfred H. Heineken (1923-2002) established the Heineken Prizes in 1964 in honour of his father (Dr Henry P. Heineken, 1886-1971). His daughter, Charlene L. de Carvalho-Heineken (born in 1954), is continuing her father’s tradition as the chairwoman of the Dr H.P. Heineken Foundation, the Dr A.H. Heineken Foundations and the C.L. de Carvalho-Heineken Foundation, which fund the prizes. In 2010, another prize was added: the Heineken Young Scientists Awards, presented to five promising young Dutch researchers. The Heineken Prizes are awarded every other year. The laureates are selected by juries made up of members of the Royal Netherlands Academy of Arts and Sciences. Each of the Heineken science prizes is USD 200,000. The Heineken Prize for Art is EUR 100,000. The incentive prizes for young scientists are EUR 10,000 each. The winners of the science prizes will be announced at the end of April 2016. For more information, interviews and images related to the Dr A.H. Heineken Prize for Art, please contact ‘Claire Beke – Communicatie in Cultuur’, beke@communicatieincultuur.com or +31 15 201 0210. For general information about the Heineken Prizes or for information about the Heineken science prizes, please contact Irene van Houten, irene.van.houten@knaw.nl, +31 20 551 0733.